I eat granola every day and bags of store bought granola can be very expensive. 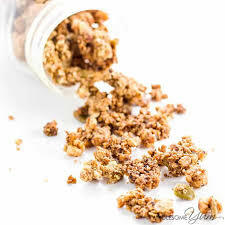 Granola is very easy to make, and if you like seeds and/or dried fruit they are a great addition. Preheat oven to 325 degrees. Put oats and pumpkin seeds in a large bowl. In a saucepan on high heat, whisk together remaining ingredients and boil. Remove from heat, pour over oats and toss to coat. Line 2 cookie sheets with foil and grease. Spread oat mixture evenly on both cookie sheets. Bake for 45-50 minutes, stirring every 15 minutes. Cool completely and store in airtight container. *3 tsp. of pumpkin pie spice can be substituted for the cinnamon, ginger, nutmeg and cloves.